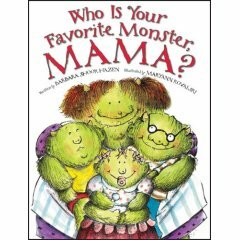 Book Buds Kidlit Reviews: Monsters! On some levels, being a mom of very young children is a little like being a rock star. I’m the center of my children’s universe, both girls thrilling to play with me, show off for me, follow me around or simply cuddle. Their looks of naked adulation I memorize for recall in later years when my star inevitably falls. And then there’s all the screaming, the sleepless nights, the empty bottles strewn about. Harry is a little monster who loves his mama, and his mama loves him “as much as a mountain, as wide as outside, and deeper every day.” He’s happy when he is the center of Mama’s attention. But when Mama can’t come running because she is tending to baby sister Bronwen or big brother Bruxley, the green-eyed monster takes over our little green guy, leading him to believe Mama has more time for his siblings than for him. Proving that monster children take the same logical leaps as human kids, Harry decides Mama must love Bronwen and Bruxley more than she loves him. But Mama is clever, and helps Harry figure out for himself that she loves all of her furry, warty children the most. Little Harry is happy again. Mama’s response makes perfect sense to me, now that I’m a mom and I love both of my kids the same – with every particle of my being and with an intensity that would be frightening if it weren’t so natural. No rock star ever loved her fans as much. My Dad wasn't fooled for a minute. While the rest of the country panicked at the thought of a Martian invasion, Dad sat thrilled by the radio on October 30, 1938 as Orson Welles updated the sci-fi classic "The War of the Worlds." Unlike thousands of others who fled their homes, jammed traffic or prepared for the worst, Dad caught the fact it was just a show. At least, that's what he claimed. McCarthy captures the wide-eyed hysteria that accompanied the notorious broadcast, plus we get to see slobbery, tentacled aliens. Yes! With tongue firmly planted in cheek and a retro touch to her brush, she reprints some of the script and depicts what people imagined was happening. Cut to reality: jammed switchboards and clogged intersections, and a desolate pasture in a New Jersey town called Grovers Mill (in Princeton Township) where the first ship allegedly landed. I've actually seen the water tower people mistook for a "Martian cylinder." I guess it's easy to laugh now, eh? As she cuts back and forth from fictional to real, McCarthy's palette shifts from rusty Martian reds to black-and-gray tones, as if listeners were extras in a 1930s movie. She stays true to the era and resists the temptation to slide into 1950s B-movie camp. Beginning and substantial end notes flesh out this fascinating glimpse into how one nutty genius hoodwinked a country. Karl Rove, are you listening? This books is silly, and that’s a compliment. When Sophie’s family buys a sofa at a rummage sale, a silent, unmoveable creature comes stuck to it. The book’s dedication to Jim Henson, creator of the Muppets, probably accounts for the figure’s resemblance to the famous puppets, with his blue skin, yellow bulb nose and purple hair. He won’t budge, and the book’s at its quirkiest with the couch getting dragged on family outings, until one day he springs to life in a quick and instinctive act of love. The story’s playful innocence is also reminiscent of Henson, but rendered with the tenderness and simplicity of a bedtime story.